After what can only be described as a very slow start to the year after shattering my finger, it’s become a very successful season for us. It looked like we were going to be fighting an uphill battle to get all of the horses qualified in their respective classes for the regional championships but we got there! 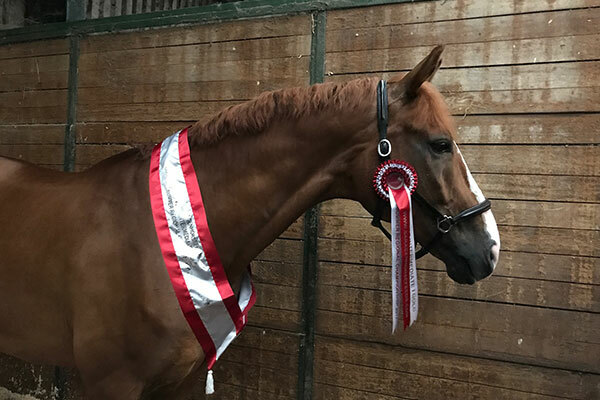 Robin (Headmore Dirubinio) exceeded all of our expectations at his first premier league at Wellington by winning the advanced medium direct qualifier for the Nationals with over 73% – meaning that he went straight through to Stoneleigh and didn’t have to contest a regional at advanced medium. We were thrilled as, in his first proper season competing, he was the first horse to qualify for the Nationals and it was very unexpected! 5-year-old Bella (Headmore Bella Ruby) was the first to contest a championship in the young horse semi-finals. She was a superstar at Hartpury for the first semi-final, but just missed out on a top 5 finish by 0.02. It was rather frustrating as the top 5 go through to the nationals in September, so we decided to take her up to Port Royal to contest the other semi-final. Mum wasn’t convinced about trekking up there, but Bella had been so close to qualifying at Hartpury that I felt it was worth the trip. Thankfully she finished 4th meaning that she booked her place at Stoneleigh and making the journey home a pleasant one! We then started a very busy round of regionals at Hickstead. I didn’t compete but we were there supporting Dannie Morgan. He contested the medium silver with Davina (Headmore Davina). Although it wasn’t one of their best as there were a few uncharacteristic mistakes they still finished 2nd on over 70% to qualify for the Nationals. He then competed in the advanced medium silver the following day with his own horse Barry (Southern Cross Braemar). They produced a super test to finish a close 2nd on just under 70% so we have our fingers crossed for a wildcard for them. Next up was Robin with his PSG. I was just hoping for a confidence giving ride for him as he is still very green at that level. I was thrilled to finish 5th in a big class at Mount Ballan and it’s exciting to think of what is to come with him when he has more competition experience. Next stop was Bury Farm with Joanne Graham Whelan’s Tank (Headmore Wimoweh) and Caroline Dibden’s Finn (Headmore Diffinity). Tank was up first in the Inter I. We did a fairly safe test with just a small mistake in the 2s but it was enough to win and book his place at the Nationals. The following day was the PSG. He felt better than in the Inter I and was doing a super test until he got spooked in the final extended canter which proved costly. He still finished in the top 10 of a massive class so overall I was very pleased with him. Finn was an absolute star! He finished 4th in both his elementary gold and medium gold regional to qualify at both levels for the Championships, meaning that all five competition horses have qualified for the National Championships. But we hadn’t quite finished there as Bella still had to contest her novice regional at Keysoe. She did a lovely test to finish 5th and just missed out on qualifying for the final, a little jog in the walk proved expensive. She had a very good score however so we are hoping for a wildcard for her too. It’s certainly going to be a busy National Championships for us! 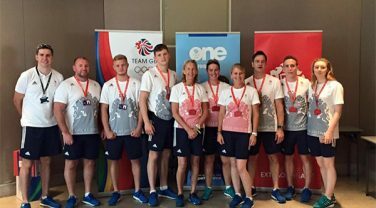 I had an incredible time on the Ambition Programme in Rio. I feel so honoured and privileged to have been given the chance to go to Rio and watch the Olympics in that capacity.